Growing your own fruit can be a rewarding experience. Not only can you control the levels of chemicals used or take and organic approach, but you can enjoy sweet tree ripened fruit. Apricots are a good candidate for the home gardener. This is a guide about growing apricots. New trees should be planted in the early spring. They can be planted in the fall in mild areas if the trees are dormant. When selecting trees, look for trees that are least 1 year in age. Trees are self-fertile (they do not need other trees nearby to cross pollinate with in order to produce fruit), but tend to produce more successfully if planted near other varieties. Trees begin producing fruit when they are 3 to 4 years old- 3 to 4 bushels from standard varieties and 1 to 2 bushels from dwarf varieties. Apricot trees need a site with full sun, and can tolerate a wide range of soils as long as the soil is well-drained. Trees grown in northern regions benefit from being planted on the north side of buildings so trees stay cool as late as possible into the spring. Standard-sized apricot trees should be planted at least 25 feet from other trees. Dwarf varieties can be spaced between 8 and 12 feet apart. Keep an area about 4 feet in diameter free from weeds and grass during the early stages of growth. Mulch newly planted trees with several inches of organic material, leaving 3 to 4 inches around the base of the trunk free of mulch. Trees will benefit from an application of nitrogen fertilizer in the spring. Young trees should be trained to have an open center (leader trunk removed), with many well-spaced branches that are capable of bearing their heavy fruit without breaking. Shoots and suckers should be pruned annually to encourage the growth of fruiting spurs. If the tree sets a crop of fruit and no thinning is done, the overall size of the fruit will be reduced when it comes time to harvest. When fruits reach 1 inch in diameter they should be thinned to 3 to 4 fruits per cluster to increase the overall size of the remaining apricots. 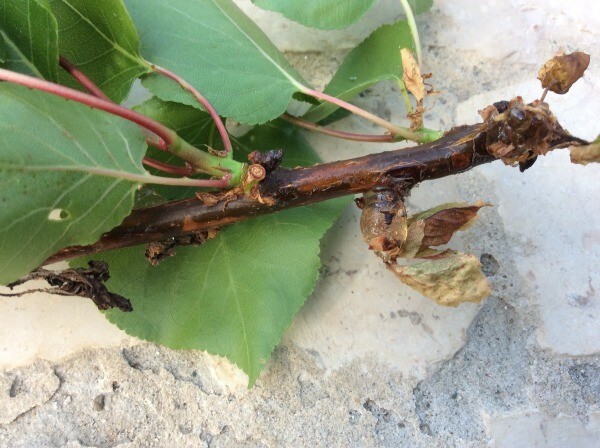 Watch for common fruit pests and diseases in the spring and fall. 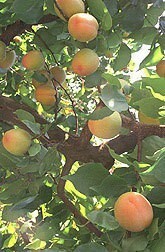 Apricots are harvested before fruit has fully ripened on the tree. The fruit is ready when it has attained a uniform color and the skin gives slightly when pressed. Harvest season peaks in July or August depending on zone. For best taste, apricots should be allowed to ripen fully before use. I have an apricot tree that is 3 year old tree. The bottom of the fruit splits than rots, on at least 50% of the fruit. I don't know about apricots but other fruits split when the water situation is not right...too much I think. I have had this happen to my tangelo, cherry tomatoes and seedless grapes. From what I understand it is from inconsistent watering, the plants are getting too dry before you water again, when you do water the plant pumps the water into the fruit the skin does not strech fast enough there for its splits open, once that happens the bacteria gets to the fruit and the rot starts. What do you do with your apricots once they are picked? I have a bag of them and don't know what to do with them! My apples did this, I was told the tree wasn't getting enough water. Am I watering my peach tree too much? Not all of the fruit splits. Peaches are the size of softballs. Very sweet and juicy. This is the first time that I have had a peach tree or any other fruit tree. Please help, I don't want to loose my tree. My tree trunk has split and the splitters are going up the tree. Now the fruit has brown strips, but when cut off the fruit is good. How do I stop the splitting and sap. I read your note on growing cherries from the pit. I am trying to start other fruit.
. I've been told. Starting fruit from seeds it's possible but not practical. Fruit will not come through from seed. I have started avocados and peaches from seed, in CA what I have done is Mark out an area (so I don't plant something else there) where I want the tree to grow and I just put a whole bunch of seeds their, if I get more than 1 I pot up the rest. Theres no way to predict how the fruit will be. You may end up with something absolutely delicious from seed you never know. and most likely some will sprout in the Spring. When the seedlings are about 2' or so tall,you can plant elsewhere during late winter. Their is also a chance that they may produce no fruit at all,...however it will take 3 years before you will see what they will bear.....one thing is for sure,you will no doubt enjoy a lot of fruit for your labour. Remember: Since apricots are self fertile you probably stand a 50-50 chance of the pip reproducing a fruit very similar in size color and flavor to the one it came from. It probably will not be exactly like the parent plant as seedlings normally vary to begin with (that's how cultivars get selected-by having varied traits which the grower perceives as superior to the original parent plant). There is a possibility however of getting a cultivar which varies from the original fruits characteristics since the fruit probably came from an orchard grown tree where there may have been more then 1 cultivar of apricot being grown. 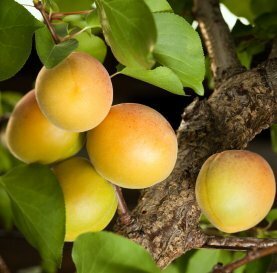 I myself plant to try growing an apricot from a pip as I cannot find the cultivar I want for sale as a grafted tree. I know I probably wont get the cultivar this way but am hoping to at least get fruit similar to what I ate in taste and color. The cultivar I wanted is often grown commercially so it is possible I will get what I want from the pip anyhow, but I read it can take between 7 & 15 years for trees to mature and produce fruit if grown from seed. Is that true? I hope not because it will be really hard to wait 7 let alone 15 years for fruit. I have an apricot tree that has a gooey looking substance ozzing out of the stems. 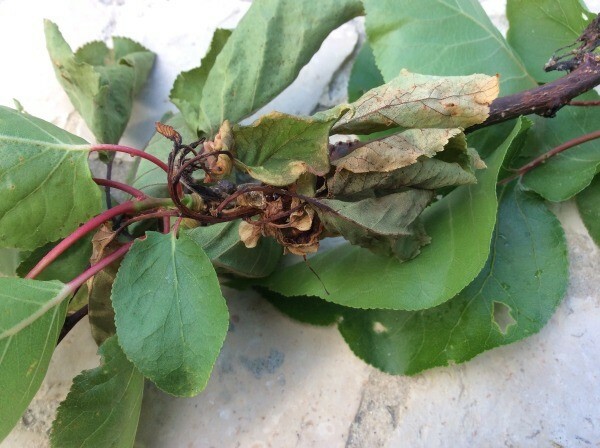 Usually it kills the leaves and the tree struggles to produce fruit. Is it fungus or a type of insect that effects it? You may have more than one disease/insect. i would recommend you discuss this with your local agriculture agency as they will be familiar with all of this. 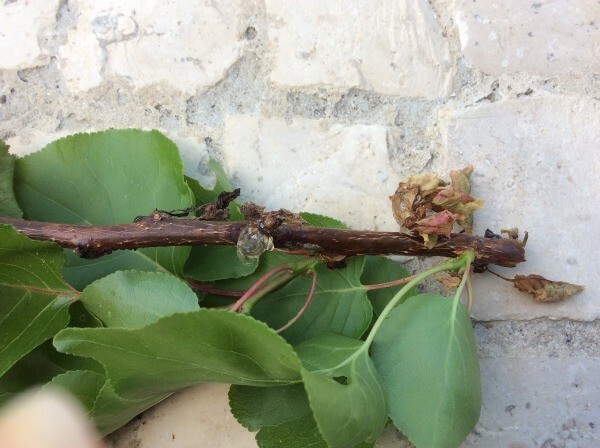 How do I get rid of bugs on an apricot tree? A few months back I bought an apricot tree (about 5ft tall), from Home Depot. I am in 10a zone (so.CA). Now at the beginning of August, my apricot lost all foliage (no leaves). What could possibly have caused it? I thought, apricots are evergreen. Here is a apricot blossom blooming in our backyard.